The opera that made Richard Strauss a household name and shocked the world. 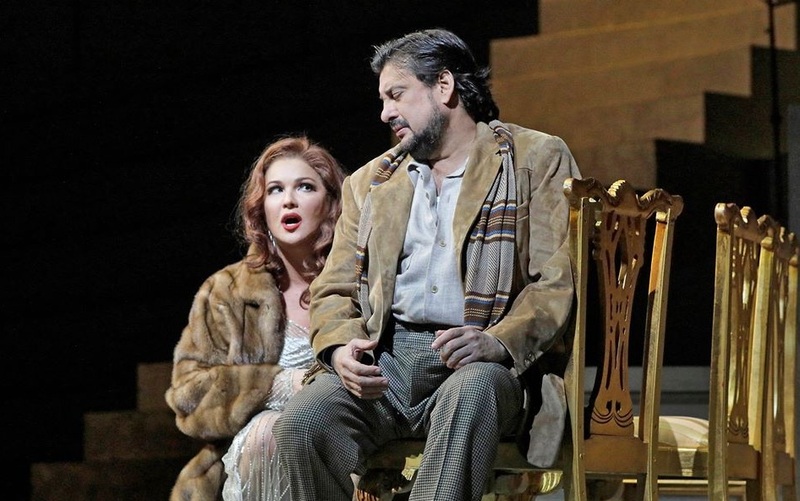 Head-hunter: Patricia Racette is Salome in the Met's new revival of Strauss' opera. Photo © San Antonio Opera. 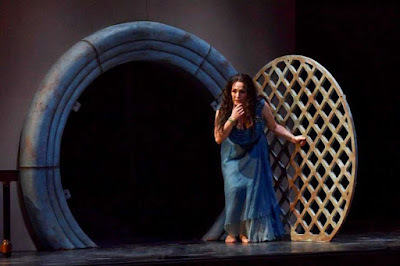 Salome is a white-knuckle ride down the road of excess, leading not to the palace of wisdom but to depravity and death. And yes the Met has scheduled performances of it right around the holidays. 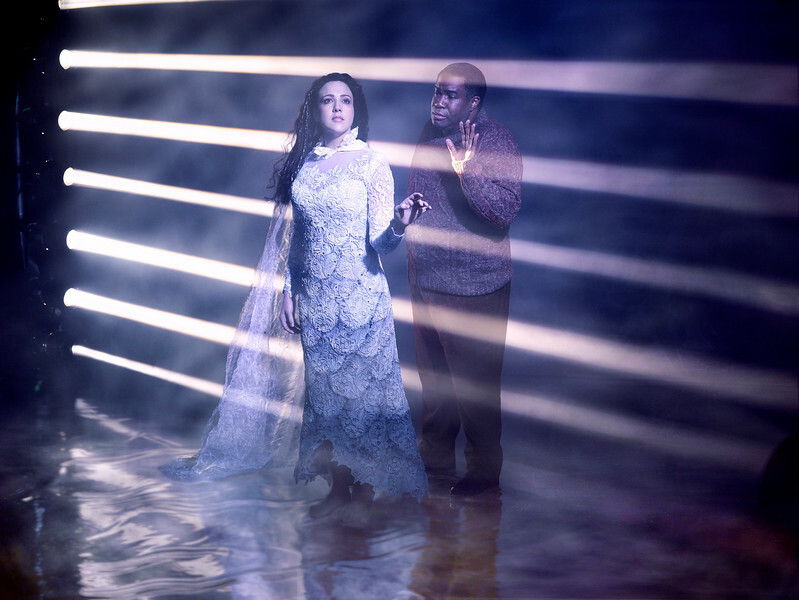 Long distance love is the subject of Kaija Saariaho's 21st century opera. Keep 'em separated: Susanna Philips and Eric Owens in L'Amour de Loin. Image © 2016 The Metropolitan Opera. Sixteen years after its Salzburg premiere and fourteen years after the first North American performances, the Metropolitan Opera finally stages L'Amour de Loin ("Love From Afar") by contemporary Finnish composer Kaija Saariaho, in a new production by Robert Lepage. 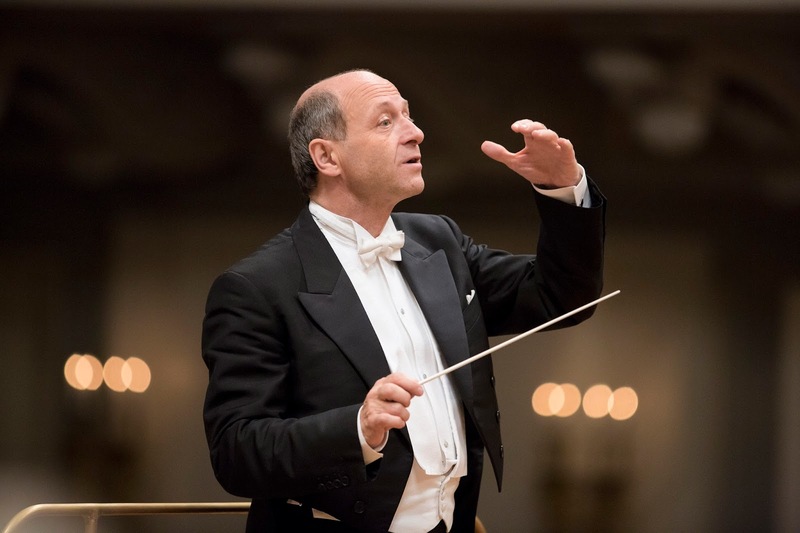 Iván Fischer leads (and reseats) the New York Philharmonic. Conductor Iván Fischer leads the New York Philharmonic this week. Photo courtesy the New York Philharmonic © 2014 The Budapest Festival Orchestra. The seating of an orchestra is usually at the discretion of the conductor. On Wednesday night, visitors to David Geffen Hall for the first of three concerts featuring Hungarian conductor Ivan Fischer and the New York Philharmonic were confronted with a radical rearrangement of the orchestra. The stage risers, almost never seen at a Philharmonic concert, were in use, putting the musicians in tiers with the basses at the top, dead center and directly opposite the conductor's podium. Kristin Opalais returns as Manon Lescaut. 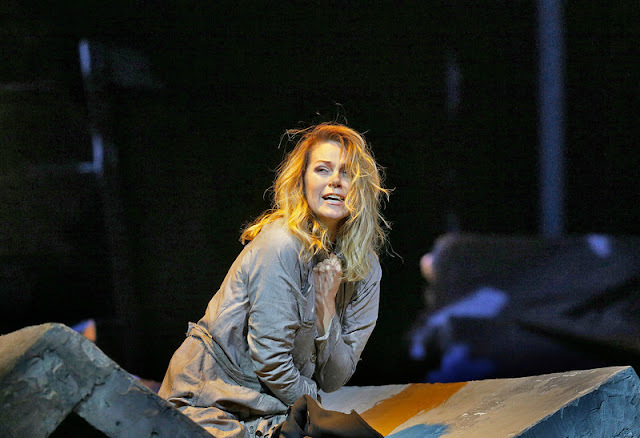 Cast aside: Kristin Opalais in the last scene of Manon Lescaut. 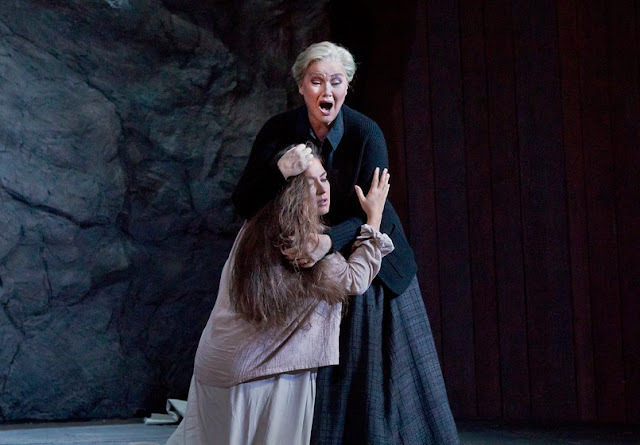 When the Metropolitan Opera opened its new Richard Eyre production of Manon Lescaut last February, it stirred up a firestorm of criticism. Mr. Eyre moved the action ahead to France in the 1940s, an occupied and defeated nation under the Nazi boot. On Monday night, this revival featuring Kristin Opalais in the role that she created last season seemed particularly on point, its oppressive sets, decadent, doomed atmosphere and the libretto's treatment of women as a commodity a set of mirrors for these troubled times. Two different takes on Beethoven's last symphony. 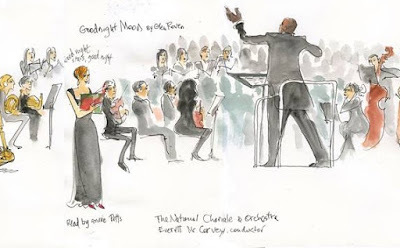 From a drawing of Friday evening's performance of Glen Roven's Goodnight Moon. Art by Joan Chiverton. Used with the kind permission of Glen Roven © 2016 Joan Chiverton. Ludwig van Beethoven's Symphony No. 9 in D minor is a difficult work to bring forth, with an heroic length that exceeds seventy minutes. The last movement requires four soloists and a chorus that can handle Beethoven's complex polyphony, the creation of a deaf composer who valued sound over ease of singing. On Friday and Saturday, two different arts organizations took on this titan, with the National Chorale offering it at Avery Fisher Hall and the Park Avenue Chamber Symphony presenting the Ninth on Carnegie Hall's main stage. Jaap van Zweden leads the New York Philharmonic. Jaap van Zweden takes aim. Photo by Chris Lee © 2016 The New York Philharmonic. 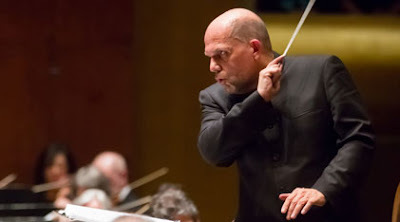 The Dutch conductor Jaap van Zweden has become something of an easy target for certain classical music commentators ever since agreeing, earlier this year to take over the duties of music director at the New York Philharmonic. Mr. van Zweden's term begins in 2018, but this week's concerts gave New York music lovers a chance to hear the heir apparent at the controls of the orchestra that he will steer well into the coming decade. 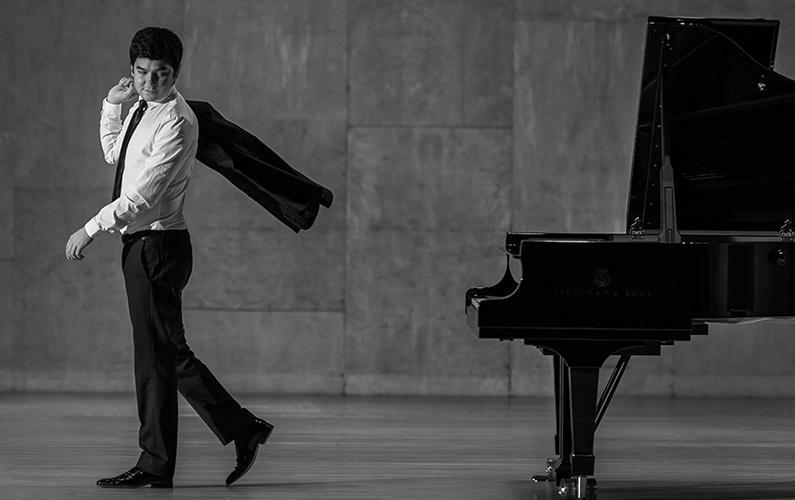 Bezhod Abduraimov makes his main stage Carnegie Hall debut. The pianist Bezhod Abdumairov and friend. In February of 2015, the young Uzbek pianist Bezhod Abduraimov made his debut at Carnegie Halls Weill Recital Hall. On Thursday night, Mr. Abduraimov made his second visit o the Hall that Music Built. This concert marked his debut on the big stage of Stern Auditorium, with a fierce and intense program of works by German, Austrian and Russian composers. Juilliard Opera lifts off with Jonathan Dove's Flight. Stuck in the aurport with you: the Refugee (Jakub Józef Orliński, left) and anunhappy couple in a scene from Flight. Photo by Rosalie O'Connor for The Juilliard School. It is rare to encounter a contemporary opera that is, at once musically rich, dramatically moving and funny as hell. Such an opera is Jonathan Davis' 1998 opus Flight, which landed on the stage of Juilliard's Peter Jay Sharp Theater on Wednesday night. This is the second New York production of this contemporary masterpiece, with a witty libretto owing something to Lorenzo Da Ponte. Flight is a comedy for our modern age, chronicling the travails of anonymous travelers trapped in an airport terminal overnight, their trips delayed by an electrical storm. Yannick Nézet-Séguin returns to Carnegie Hall. 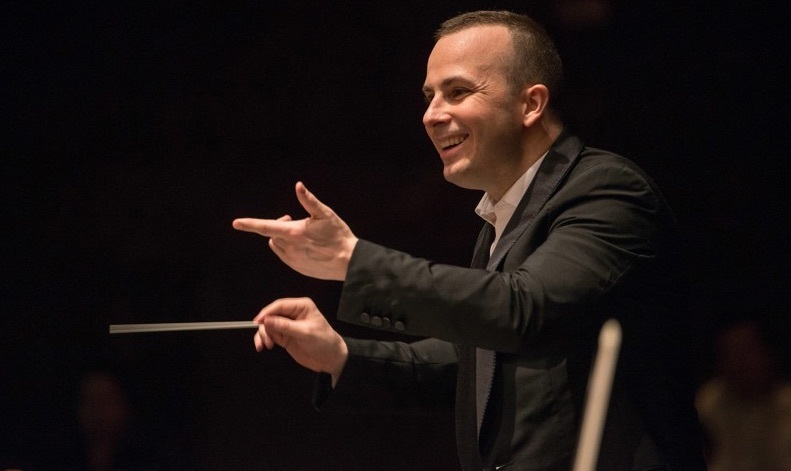 Yannick Nézet-Séguin brought the Philadelphia Orchestra back to Carnegie Hall. Photo by Jan Regan for the Philadelphia Orchestra. The Philadelphia Orchestra are regular visitors to the great stage of Carnegie Hall. Tuesday night saw the band's first New York appearance this season with music director Yannick Nézet-Seguin at the helm. The dynamic young Quebeçois conductor is one of the genuine podium stars of this new century, drawing the focus of New Yorkers since he accepted the job of successor to James Levine (starting in 2020) at the Metropolitan Opera. His loyal troops were given a solid program that played to their strengths: a Prokofiev concerto bookended by two major works from Maurice Ravel. Renée Fleming premieres Letters from Georgia by Kevin Puts. 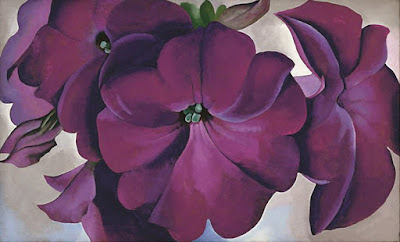 Petunias by Georgia O'Keeffe © 1924 The Georgia O'Keeffe Museum. Most concerts at Alice Tully Hall are pretty staid affairs. Refreshments are usually limited to the occasional output of the American Table Restaurant and a standard Lincoln Center refreshment bar offering hot coffee and maybe the occasional little sandwich. So it was a welcome surprise to this reviewer to show up for Monday night's concert featuring the Eastman Philharmonia and soprano Renée Fleming and to find the glass lobby on the corner of W. 65th and Broadway the site of an elegant and catered soirée. Marc-André Hamelin at the 92nd St. Y.
Pianist Marc-André Hamelin returned to New York on Saturday night. Photo © 2016 Hyperion Records courtesy Hemsing Associates. 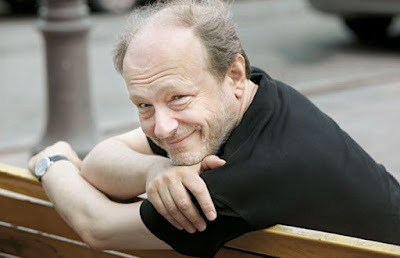 A visit from the pianist Marc-André Hamelin is an occasion for happines among New Yorkers. The Canadian-born, Boston-based virtuoso has recorded a vast array of difficult works by the likes of Liszt, Alkan and Godowsky. More recently, he has recently turned his attention to the more familiar works of Haydn and Mozart. Saturday night's recital at the 92nd St. Y's Kaufman Auditorium was focused almost exclusively on the latter, presenting six Mozart pieces in a brief but satisfying concert. 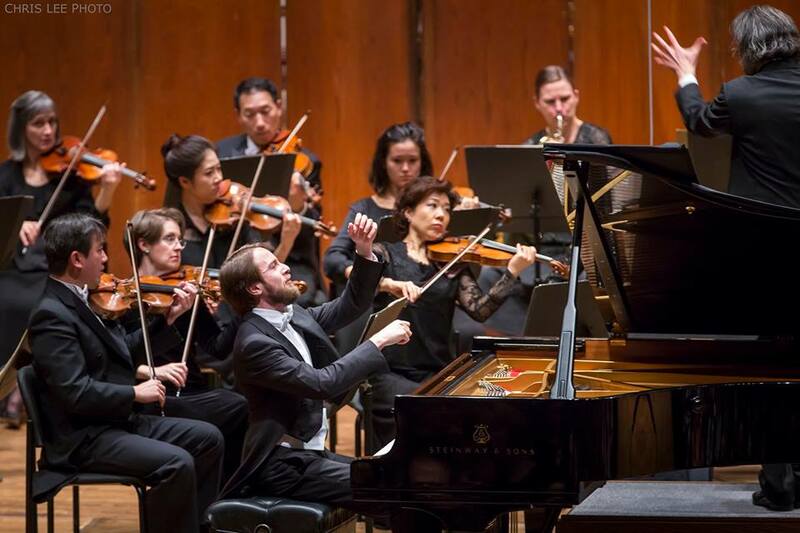 Mozart and Ravel at the New York Philharmonic. and members of the New York Philharmonic. Photo by Chris Lee © 2016 The New York Philharmonic. The conductor Vladimir Jurowski is the music director of the London Philharmonic and an occasional visitor at the Met, where he is called on to untangle knotty operas like Richard Strauss' Die Frau Ohne Schatten. This week at the New York Philharmonic, he faced a program requiring precision in all of its aspects, from the arch accompaniment written in the Mozart Concerto No. 25 to the vast mythic landscapes of the Ravel ballet Daphnis et Chlöe, itself that composer's most ambitious work and a miracle of orchestration written on a grand and encompassing scale. The Berlin Philharmonic explores the roots of atonality. 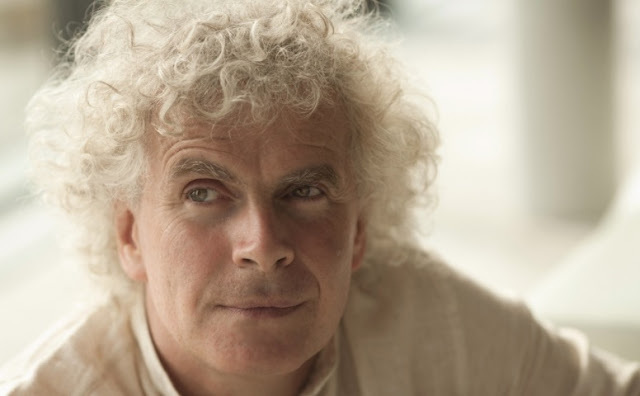 Sir Simon Rattle. Image © Berlin Philharmonic for the Digital Concert Hall. Although the composer Johannes Brahms lived a long life, he went to his grave a bachelor and without issue. However, it can be argued that the composers of the Second Viennese School are in some ways his spiritual children. Arnold Schoenberg and his pupils Anton Webern and Alban Berg took Brahms' ideas to a logical extreme, with short, aphoristic orchestral pieces that themselves signalled a new kind of music. On Thursday night at Carnegie Hall, Sir Simon Rattle and the Berlin Philharmonic offered an ambitious program at Carnegie Hall, placing all four composers side by side to see if this connection would become evident. 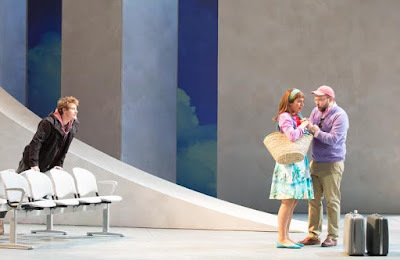 in a scene from Manon Lescaut. Photo by Ken Howard © 2016 The Metropolitan Opera. Anna Netrebko, currently the most marketable soprano on the planet takes on a major Puccini role in her continued bid for world supremacy. She will play the title role in the Met's new-ish production of Manon Lescaut, just five years after she played the title role in Massenet's Manon. Sir Simon Rattle and the Berlin Philharmonic at Carnegie Hall. 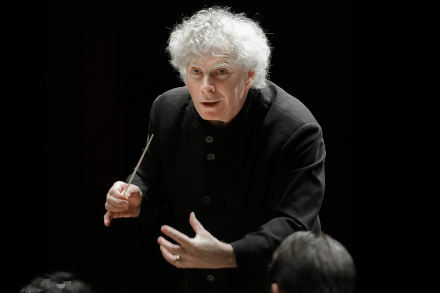 The redoubtable Sir Simon Rattle brought the Berlin Philharmonic back to New York this week. Photo by Thomas Rabsch © Thomas Rabsch licensed to Warner Brothers Classics. The tenure of British conductor Sir Simon Rattle at the helm of the Berlin Philharmonic is coming to an end. Starting next season, the Liverpool-born conductor prepares to mount the podium of another legendary ensemble: the London Symphony Orchestra. Before that happy event, there is the business of a North American tour with the Berliners, a tour which stopped at Carnegie Hall on Wednesday night for the first of two concerts this week. 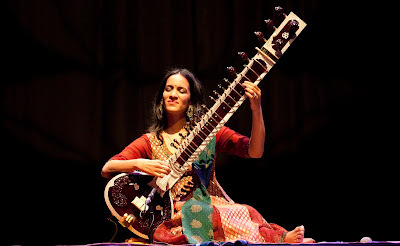 Anoushka Shankar with the New York Philharmonic. Anoushka Shankar and friend. Photo by Belinda Lawley. The classical music of India is very different than that created in Europe and the Americas. Building a bridge between its system of ragas, alaps and talas and the Western system of keys, chords and scales sounds like an impossible task. But not for Ravi Shankar, the master of the sitar and the face of Indian music in the 20th century. Shankar did this not once but twice, writing two extensive concertos for sitar and orchestra, a bridge of sound across the gulf between cultures and proud traditions of east and west. On Thursday evening last week, the New York Philharmonic offered the first of three performances of Mr. Shankar's Rāgā-Mālā ("Garden of Ragas") Concerto No. 2 for Sitar and Orchestra with the composer's daughter Anoushka Shankar as the soloist. This concert was originally scheduled to be led by Zubin Mehta, who commissioned this concerto in 1979 and conducted its premiere in 1981. He withdrew due to illness and Manfred Honeck stepped in as an exceptionally qualified replacement. Joshua Bell at Alice Tully Hall. Joshua Bell at work. Photo by Kirk Fratzke for the Minnesota Beethoven Festival. 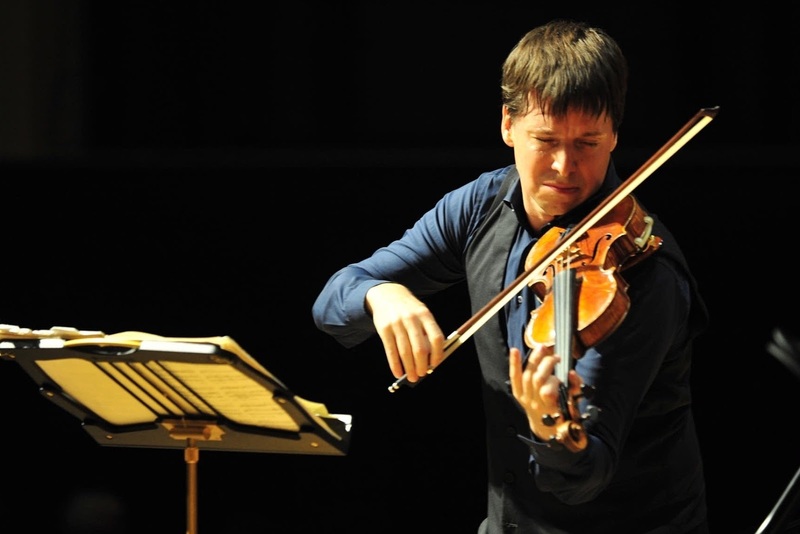 The violinist Joshua Bell holds a high profile among masters of his instrument, regularly appearing as a soloist with major orchestras or leading his own current band, the Academy of St. Martin-in-the-Fields. 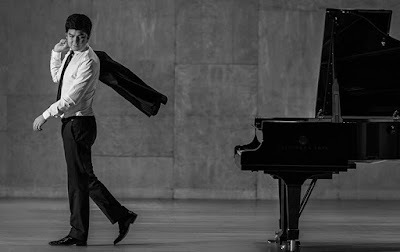 On Thursday night, Mr. Bell gave a recital with pianist Alessio Bax at Lincoln Center's Alice Tully Hall, exploring the dichotomy between academic, formal works written for the violin and the flashy virtuoso pieces that dominated the latter half of the 19th century. And back to music soon after...promise! 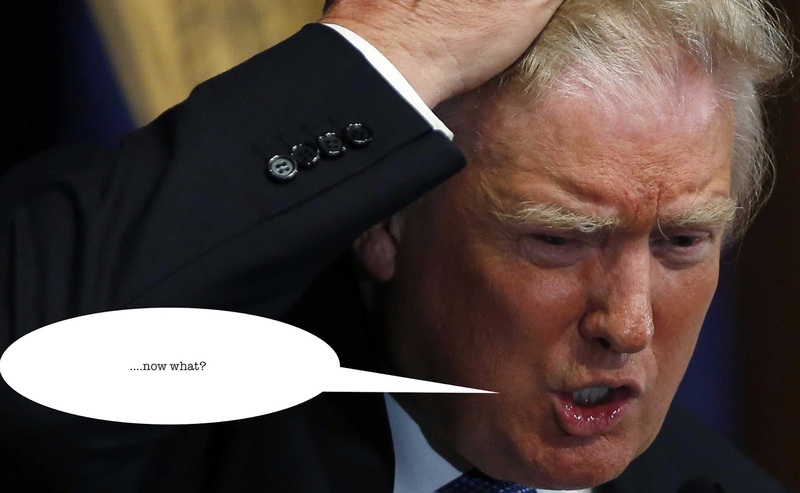 It is impossible for Superconductor to exist in a bubble, or to allow the events of last night's election of Donald Trump as the 45th President of the United States of America to pass without comment. This blog is not a political forum and it is not normally a place for such things, but I cannot get my regular blog writing done without getting these words out of my system. Steve Reich turns 80 at Carnegie Hall. Footage from Hindenburg, part of Steve Reich's Three Tales. Image by Beryl Korot © 2002 Nonesuch Records. Steve Reich is now 80, and remains at the forefront of the school of American minimalism. On Tuesday night, Carnegie Hall celebrated Mr. Reich's birthday with a concert featuring Sō Percussion, the International Contemporary Ensemble, members of Synergy Vocals and three of Mr. Reich's major compositions, including first Carnegie Hall presentation of his 2002 "video opera" Three Tales, a collaboration with his wife Beryl Korot. The Met revives Leoš Janáček's Jenůfa. Karita Mattila (standing) holds Oksana Dyka in a key scene from Act II of Jenůfa. This latest Met revival of Jenůfa, the third opera by Czech composer Leoš Janáček is one of the most important productions of the current season. It allows a new generation of opera-goers to discover one of the most powerful dramas of the 20th century, thanks to the presence of a near-ideal cast. On Monday night, soprano Oksana Dyka was incandescent in the title role, a peasant girl whose suffering makes her one of the great operatic heroines. She's pregnant by a man that does not love her. 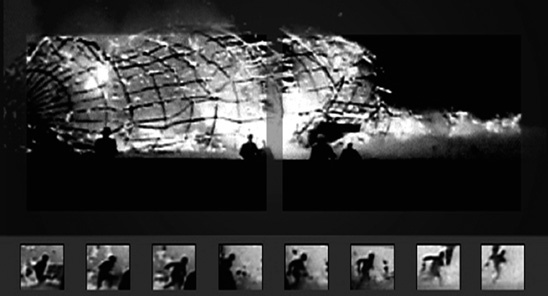 She is attacked and mutilated by his love-struck brother. And then the baby is drowned. Labels: classical music, Czech Opera, jenufa, karita mattila, Met, Met Opera, Metropolitan Opera, Oksana Dyka, opera review, Paul Pelkonen, Superconductor. The London Symphony Orchestra at NJPAC. 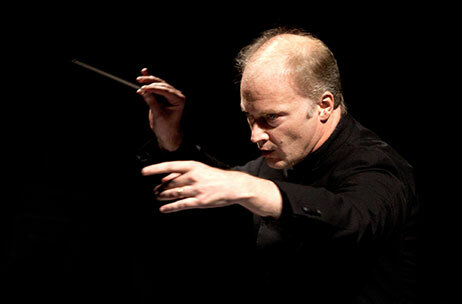 Miracle man: conductor Gianandrea Noseda in action. Photo © 2016 Teatro Regio di Torino. The London Symphony Orchestra are in transition. Valery Gergiev left for a post in Munich, and the orchestra awaits the arrival of its next chosen leader, Sir Simon Rattle, in 2017. Their current North American tour (which stopped at Prudential Hall in Newark on Saturday night) is lead by associate principal conductor Gianandrea Noseda, an Italian maestro who has worked operatic miracles in the pit at the Metropolitan Opera in recent years, and will soon be known to American audiences as the newly minted leader of the National Symphony Orchestra in Washington D.C.